We were in Texas recently, where my grandpa is in an assisted care facility. 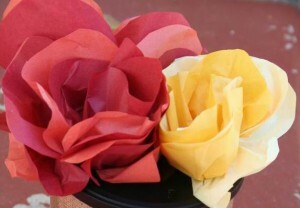 I wanted to give him something that would brighten up his room, but not die like real flowers. These are not hard, and sort of relaxing to make, something you can do while watching the kids ride their scooters. Unless you have a baby who’s into grabbing everything. In that case, wait a year or three. 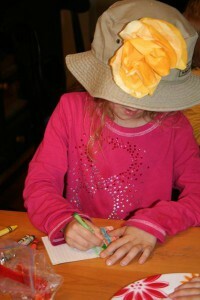 These would be fun and relatively non-messy for your kids to make for Mother’s Day or Grandparent’s Day. 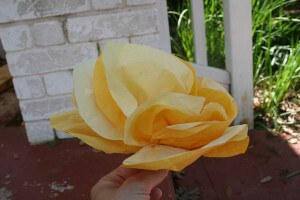 Step one: cut some tissue paper and stack it up. Contrasting colors look nice. 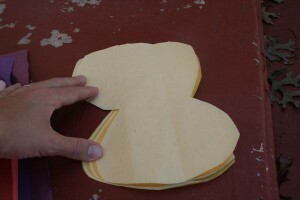 Cut it into a "8" shape. 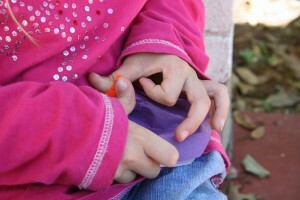 Twist a pipecleaner around the middle; twist nice and tight. 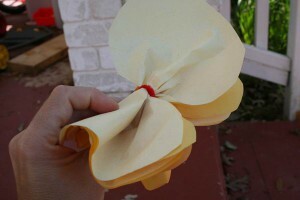 Twist each "petal" up and around to make it flowerlike. 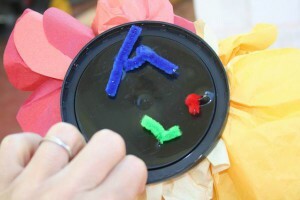 Poke holes in a coffee can lid and poke the pipecleaner through. 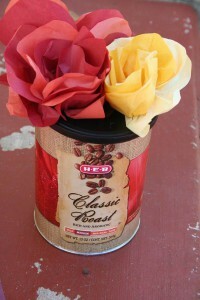 Put all the flowers through the lid and cover the can with tissue paper. I don’t have a final picture of the can covered with tissue paper, but you get the idea. 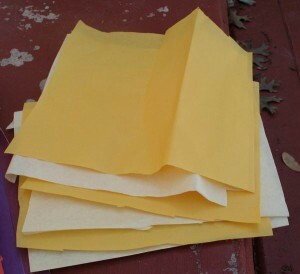 You just wrap it in a solid color of tissue paper, tape it in the back, and your child can write their name if they want. To: Grandpa From: your child. Sweet little hands can help. or use them for a fancy hat. My aunt helped me string a garland of them. This was for the light fixture over my grandpa’s bed. The room was so sterile, we thought it needed a little cheer. 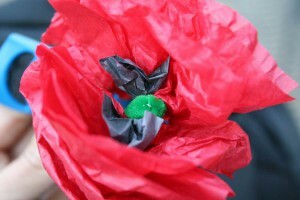 And my son made this version, a poppy, in co-op. I think the poppy is my favorite! Anyway, these are a fun spring or summer activity, and would be fun to make for a neighbor or grandparent, and I bet Grandma would love some for Mother’s Day. Not that we’re going to do that, as I’m getting ready for the Arlington Homeschool Book Fair and trying to finish up our school, but someday I’m sure we’ll do it again.